Using Spectral Analysis in an AutoGlow Plasma System as a method for detecting and analyzing surface films. 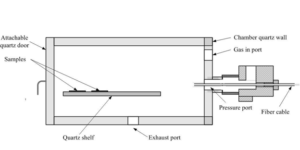 Excerpt from the Patent: An Autoglow (Glow Research) plasma chamber with an integrated fiber optic cable connected to a QE Pro Spectrometer (Ocean Optics) was used for cleaning and spectral analysis. 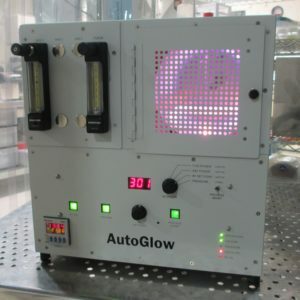 Prior to testing the titanium alloy samples, the quartz chamber of the Autoglow was cleaned using argon gas at a pressure of 0.5 Torr and a power of 200 Watts for 20 minutes. After the chamber was cleaned, the samples were each tested using the following procedure. A single coupon was placed in the center of the chamber and the chamber was vacuum degassed to a pressure of 0.23 Torr. Next the chamber was flushed with argon gas for three minutes at a pressure of 0.5 Torr. This vacuum/purge cycle was repeated two additional times in order to exhaustively remove atmospheric carbon contamination and any remaining moisture. Following the vacuum/purge cycles, an argon plasma at 0.5 Torr and 200 Watts was struck for 10 minutes. Immediately upon establishing the plasma, the spectrometer was set to record the entire spectrum from 175 nm to 950 nm every 0.1 seconds for the duration of the plasma treatment. The flushing and degassing cycle was repeated for each sample, followed by a plasma treatment and similar optical emission spectrometry analysis. Between each sample analysis the chamber was cooled down for 10 minutes under vacuum. Once a wavelength for detailed analysis was selected, a chart recorder analysis was implemented to track the peak height at 386 nm as a function of time.